اسکوئی, بهروز, تکلو, میلاد, پرخیال, سهیل. (777). تعیین محدوده مخزن زمین‌گرمایی سبلان با استفاده از وارون­سازی یک‌بُعدی و دوبُعدی داده­های مگنتوتلوریک. مجله ژئوفیزیک ایران, 9(3), 104-117. بهروز اسکوئی; میلاد تکلو; سهیل پرخیال. "تعیین محدوده مخزن زمین‌گرمایی سبلان با استفاده از وارون­سازی یک‌بُعدی و دوبُعدی داده­های مگنتوتلوریک". 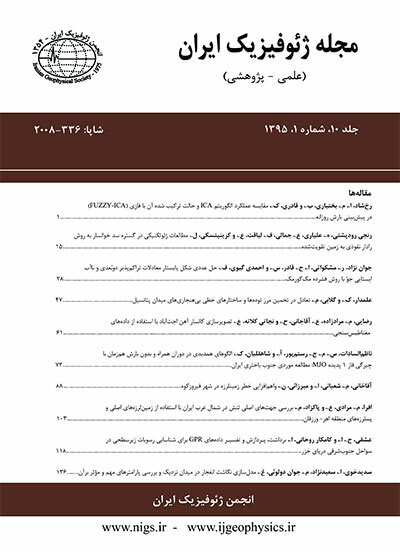 مجله ژئوفیزیک ایران, 9, 3, 777, 104-117. اسکوئی, بهروز, تکلو, میلاد, پرخیال, سهیل. (777). 'تعیین محدوده مخزن زمین‌گرمایی سبلان با استفاده از وارون­سازی یک‌بُعدی و دوبُعدی داده­های مگنتوتلوریک', مجله ژئوفیزیک ایران, 9(3), pp. 104-117. اسکوئی, بهروز, تکلو, میلاد, پرخیال, سهیل. تعیین محدوده مخزن زمین‌گرمایی سبلان با استفاده از وارون­سازی یک‌بُعدی و دوبُعدی داده­های مگنتوتلوریک. مجله ژئوفیزیک ایران, 777; 9(3): 104-117. منطقۀ آتشفشان سبلان اولین منطقه‌‌ای است در ایران که به‌منظور بررسی‌‌های زمین‌گرمایی در آن برداشت‌‌های مگنتوتلوریک صورت گرفته است. آخرین برداشت‌های مگنتوتلوریک در دوفاز برنامه‌ریزی شد. در این مقاله با تلفیق داده‌‌های مگنتوتلوریک این دو فاز محدودۀ مخزن مورد بررسی قرار می‌‌گیرد. با استفاده از تفسیر نقشه‌های هم‌مقاومت ویژۀ حاصل از وارون‌سازی یک‌بُعدی و دوبُعدی داده‌‌های مگنتوتلوریک و همچنین مقاطع مقاومت ویژۀ حاصل از وارون‌سازی دوبُعدیداده‌های مگنتوتلوریک دو مخزن اصلی قابل شناسایی است. مخزن اصلی در محدوده‌ای در قسمت غربی کوه سبلان که از سمت جنوب و جنوب غربی قلۀ سبلان به سمت غرب و درۀ موئیل کشیدگی دارد و بیش از دو برابر از محدوۀ مخزن اولیه که در تحقیقات قبلی حاصل شد بزرگ‌تر است و مخزن دیگر با وسعت کوچک‌تر در شبیل در قسمت شمالی کوه سبلان جای گرفته است. In magnetotelluric(MT) methods, perpendicular and horizontal components of the fluctuations of the magnetic and electrical fields are measured on the earth surface. The earlier MTsurveys (for example Singh and Drolia, 1983), provided qualitative information with limited narrow banded data and limited quantitative results due to noisy electric field data. Through improving the interpretation schemes and lowering the cost of data acquisition, the MT data has been traditionally obtained in profiles targeting the geological structures and then interpreted with one and two-dimensional inversions. In such an interpretation, one fits the off-diagonal impedances (Zxy and Zyx), generally after rotating the coordinate system so that the main diagonal components (Zxx and Zyy) are minimum or at least as small as possible. It rarely happens that we can find a single strike angle optimal for the full frequency range and all sites. Therefore, the potential[J91]Â impacts of off-profile structures must always be considered. By MT measurements, the electrical conductivity distribution can be determined. Based on the hydrodynamic specification of the geothermal sources, the flow can play the role of an initial parameter in the resistivity contrast of the geothermal source and its surroundings. Using this feature, MT is capable of determining the boundary between a geothermal system and its neighboring medium. Â Â Â The Mt. Sabalan region lies on the south Caspian Plate, which underthrusts the Eurasian Plate towards the north. It is in turn underthrusted by the Iranian Plate, which produces compression in a northwestern direction. Geological structures in this area are complicated further by a dextral rotational movement caused by the northward underthrusting of the nearby Arabian Plate beneath the Iranian Plate. Â Â Â The Sabalan geothermal area lies at the northwest slope of Mt. Sabalan, an immense stratovolcano located in the province of Ardebil in northwestern Iran.For the first time in Iran, MT surveys for geothermal investigations have been carried out at around the Sabalan volcano. This study aimed to delineate the shallow as well as deep conductive anomalies related to the geothermal systems in Sabalan area.To investigate the Sabalan geothermal reservoirs more closelyandto determine the injection and explorationwells, the magnetotelluric data wasscheduled in two phases. MT measurements, in the Sabalan area, could clearly highlight the geothermal reservoir. In this work, the boundaries of the reservoirs were investigated by using integration of MT data.The resistivity sections derived from a 2Dinversion in conjunction with exploration wells and geology surveys showed that the Sabalan geothermal system is in agreement with Johnstonâs (1992) model in which the thicker conductive layers are found in the output areas.Two main reservoirs have been detected by using an interpretation of resistivity maps resulted from 1D and 2D inversions of the MT data. The main reservoir is located on the western side of Mt. Sabalan, which extends from south and southwest of Sabalan summit towards the west and Mooeil valley. The dimensions of this reservoir are two times bigger than the estimated volume resulted from earlier researches. The other reservoir with relatively smaller dimensions exists in northern part of Mt. Sabalan. تکلو، م.، اسکوئی، ب. و پرخیال، س.، 1392، بررسی مرز لایه‌‌‌ها و توده‌‌های زمین‌گرمایی منطقۀ سبلان با استفاده از برگردان دوبُعدی داده‌های مگنتوتلوریک ، مجلۀ فیزیک زمین و فضا، دوره 39، شماره 4. Asaue, H., Koike, K., Yoshinaga, T., and Takakura, Sh., 2006, Magnetotelluric resistivity modeling for 3D characterization of geothermal reservoirs in the Western side of Mt. Aso, SW Japan: Journal of applied geophysics 58, 296-312. Cagniard, L. 1953. Basic theory of magnetotelluric method in geophysical prospecting. Geophysics 8, 605-635. Constable, S. C., Parker, R. L., and Constable, C. G. (1987). Occam’s Inversion: A Practical Algorithm For Generating Smooth Models From Electromagnetic Sounding Data. Geophys., 52, 289-300. Didon, J. and Gemain, Y.A., 1976. La Sabalan, volcan Plio-Quaternair de L’Azerbaijn orientat (Iran), Etude geologiquee et petrographique de L’edifice et de son environment regional. These 3 eeme cycle, Univ. Sceintifique et Medicale de Grenoble, France. Eggers D. E., 1982. An eigenstate formulation of the Magnetotelluric impedance tensor, Geophysics, 47, 1204-1214. Fanaee kheirabadi, gh. And oskooi, b., 2011. Magnetotelluric interpretation of the Sabalan geothermal field in the northwest of Iran. Journal of the Earth & Space Physics. Vol. 37, No. 3, 2011, P. 1-11. Johnston, J. M., Pellerin, L. and Hohmann, G. W. (1992). Evaluation of Electromagnetic Methods For Geothermal Reservoir Detection. Geothermal Resource Council Transactions, Vol 16pp 241-245. KML, 1998, Sabalan geothermal project, Stage1—Surface exploration, ﬁnal exploration report. Kingston Morrison Limited Co., report 2505- RPT- GE- 003 for the Renewable Energy Organization of Iran, Tehran, 83pp. Mackie R. L. and Madden T. R., 1993. Three-dimensional Magnetotelluric Inversion Using Conjugate Gradients. Geophysics J. Int., 115, pp.215-229. Noorollahi Y., Itoi R., Tanaka T. 2007. Well Testing and Reservoir Oroperties Analyzing in Sabalan Geothermal Field al, North Western Iran. in: 5th International Symposium on Earth Science and Technology, 3-4 Dec. 2007, Fukuoka-Japan; PP.247-253. Porkhial, S.,Rigor, D. ,Bayrante , B.,Domingo, B. (2010) Magnetotelluric Survey of NW Sabalan Geothermal Project, Iran Proceedings World Geothermal Congress 2010 Bali, Indonesia. Simpson, F., Bahr, K., 2005. Practical Magnetotellurics. Cambridge University Press, Cambridge. Singh, S.B., Drolia, R.K., Sharma, S.R., Gupta, M.L., 1983. Application of resistivity surveying to geothermal exploration in the Puga Valley, India. Geoexploration 21 (1), 1– 11. SKM Report to SUNA: NW Sabalan Geothermal Project: MT Survey RE-Analysis, Revision 2,REP No: AP00079-RPT-GE-109, 28 October 2003. Spichak, V., Zakharova, O., Rybin, A., 2007. Estimation of the sub-surface temperature by means of magnetotelluric sounding. Thirty-Second Workshop on Geothermal Reservoir Engineering Stanford University, Stanford, California. p. SGP-TR-183. Sternberg, B. K., Washburn, J. C. and Pellerin, L., 1988. Currection for the static shift in magnetotellurics using transient electromagnetic sounding. Geophysics, 53, 1459-1468. Swift C. M., Jr., 1967. A magnetotelluric investigation of an electrical conductivity anomaly in the southwestern united states: Ph.D. thesis, Mass. Inst. Of Tech. Talebi, B., Khoswari, K., and Ussher, G. H. 2005. Review of Resistivity Surveys From The NW Sabalan Geothermal Field, Iran. Proceedings from the 2005 World Geothermal Congress, Antalya, Turkey. Vozoff K., 1972. The magnetotelluric method in exploration of sedimentary basins, Geophysics, 37, 98-141. Vozoff, k. Nabighian., (1991) , M.C.(ed. ).Electromagnetic Methods in Applied Geophysics, Vol.2: Application,Part B. Tusla: Society of Exploration Geophysics, 641-711. Zhdanov, M. S. and Keller, G. V., 1998, The geoelectrical methods in geophysical exploration, method In Geochemistry and Geophysics, 31, 261-346.